Just to start: the word "gauge" is one of my spelling blind spots. For some reason, my brain keeps trying to spell it guage. I have no idea why. Maybe this post might cure that! Jayne raised the question in a comment to my earllier Glenbrook posts as to whether Glenbrook Vintage Railway's gauge was 3' 6" or narrow gauge. Indeed it is, according to sources online. 3' 6" is the standard gauge for NZ rail, and has been ever since Julius Vogel and his 19th century Think Big policies. Why? According to this article from New Zealand Railway Magazine, it's all about cost, and making those pounds stirling he'd borrowed from London spin out just that wee bit more. Viewing what has happened during the past 58 years it will be granted that New Zealand was wise in adopting the moderate gauge it chose. We have improved, as our revenue has increased, the equipment of our railways, in carriages, engines, station buildings, workshops, and so forth. It is true that our recent line have been more elaborately and consequently, more expensively constructed. Had, however, the policy of 1870 not been followed, we would not to-day possess the mileage of lines we have." 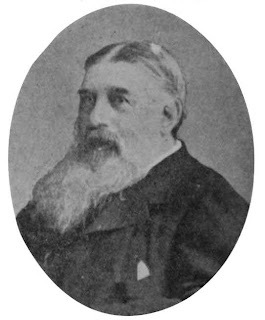 The image above, from the NZETC link, is Sir Julius Vogel, K.C.M.G. 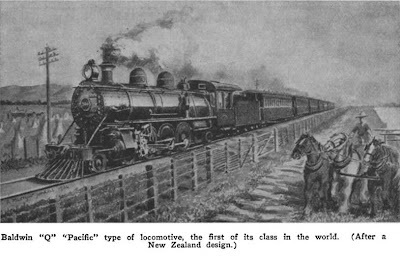 The gauge, plus our country's terrain, led to the development of the "Pacific class" of locomotive, as described here. "The often steep grades and tight curves imposed by the formidable terrain required more power at all operating speeds than was usual. This led to the early development of the oversize firebox, wider than the 3'6" gauge, supported by a 2-wheel trailing truck thus creating the classic "Pacific" locomotive with a 4-6-2 wheel arrangement compared to the 4-6-0 "Ten-Wheeler". In turn, the available power led to a then-astonishing turn of sustained speed that prompted the adoption of the type all over the world." How very canny and civilised! Here in Oz we had every kind of gauge you could imagine and even 2 foot 6 inch narrow gauge the govt dreamt up! LOL "Independent-mindedness" is a polite way of putting it! Twas a right royal mess with people having to disembark from trains at state borders to change trains due to gauge differences. Mark Twain had some biting commentary about the inconvenience of the different gauges.